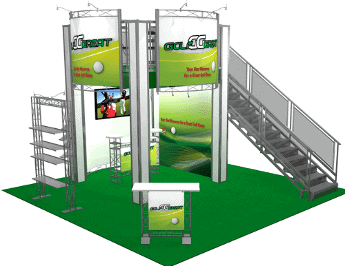 20 x 20 Local Las Vegas Tradeshow Builder double deck model uses lightweight modular components and signature 3D graphics to communicate your brand message clearly. With locations in Las Vegas and Orlando, and distribution worldwide, we can offer this configuration at a fraction of the price of our competitors. This booth is delivered worldwide in under 90 days and domestically in under 60. For more information in regard to 20 x 20 Local Las Vegas Tradeshow Builder 1, give us a call at (800)-354-6022 or send us an email at [email protected] Contact us today for your complimentary consultation.